Where is Dwight Howard headed? We are now seeing living proof that the Dwight Howard drama may never end, or will at least continue throughout the summer starting tonight at midnight, when teams are allowed to begin contacting free agents. Considering that he probably is the top free agent on the market, with Chris Paul more and more likely re-signing with the Clippers, there will be a lot of interest, especially since elite centers are so hard to come by. 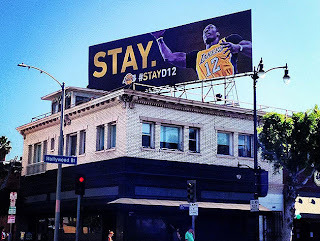 So will Howard stay with the Lakers or sign with somebody else? Let's start the conversation with Howard's current club, who do have an advantage of offering Howard more money than any other club, $30 million more to be exact. However, after a pretty disappointing season not just for the club but for Howard as well, plus some inkling that Howard was not down with coach Mike D'Antoni's system, there are what I would consider to be reasonable reasons for Howard not to come back to the Lakers. 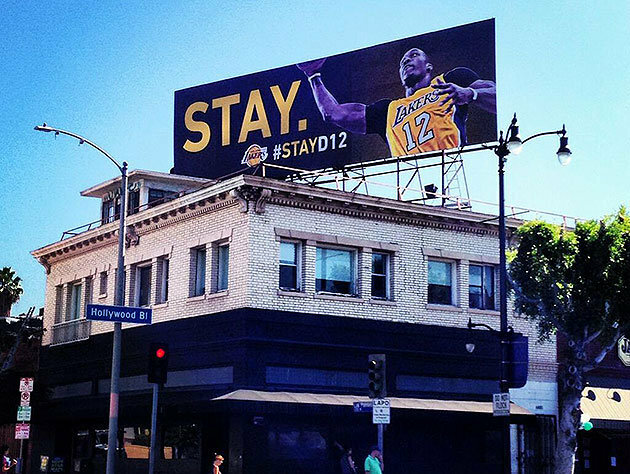 But apparently the club's aggressive pursuit, featuring multiple banners across Los Angeles like the one pictured above as well as utilizing Kobe Bryant and Steve Nash to approach Howard about staying in town. The first club that Howard will be meeting with this week will be the Houston Rockets, who offer a pretty desirable situation. The state's tax-friendly image always makes it appealing for free agents but considering that the Rockets, with newly acquired James Harden, were one of the more fun and exciting clubs in the league this year. Adding Howard to the club's talented base would make them a real contender in the Western Conference, but it would cause the club to change their system that worked out so well this year to fit in Howard. Now that we are speaking about the Lone Star State, the Dallas Mavericks are very much in the mix for Howard, as they were hoping to be a year ago when he was dealt to Los Angeles. However, they are going to have to do some work with their cap situation just to fit in Howard, and that is coupled with an aging, declining roster. Of course, Mark Cuban is as aggressive as any owner and Donnie Nelson is a shrewd personnel guy, but they do have a bit of a hill to climb. The Atlanta Hawks have long been thought to be a solid contender for Howard's services considering the ATL is Howard's hometown and they have a huge amount of money to spend this offseason. However, a big part of Atlanta's appeal was their ability to potentially unite Howard with Chris Paul together to build a superteam a little north of that club down in Miami, and Paul is going to stay with the Clippers. Plus, Atlanta does not have that much of an organizational history and we all know about the city's shortcomings in terms of supporting their teams. A long shot said to be getting a face-to-face with Howard are the Golden State Warriors, but it would take a lot for Howard to come to the Bay Area. Considering the club is currently over the cap by a sizable amount, a sign-and-trade deal would have to be worked out with the Lakers, which I doubt the Lakers would be willing to do not just for a divisional opponent but because the Warriors would likely be unwilling to move the pieces it would take for the Lakers to do the move.